This tutorial should give a first impression what simulation can do, what business cases are behind and how this is implemented in jBPM. A jBPM jPDL later than 3.2.2, for example jbpm 3.2.3. The sources for the tutorial are also checked in the jBPM CVS repository, so you can also checkout the HEAD revision there, then you get everything you need automatically. The first part of this tutorial needs a database, because we want to retrieve historical information out of it. This includes calculating the standard deviation, which can be done by most of the databases today (see Howto enable MySQL standard deviation calculation in Hibernate). Unfortunately, some of the database queries made trouble with the standard hibernate HQL. So at the moment I provide only a version, running on MySQL 5! I work on an optimized version for Oracle and a database independent one, which will be slower. But you can also skip the historical data part and start with the simulation right away, this doesn’t need any database! 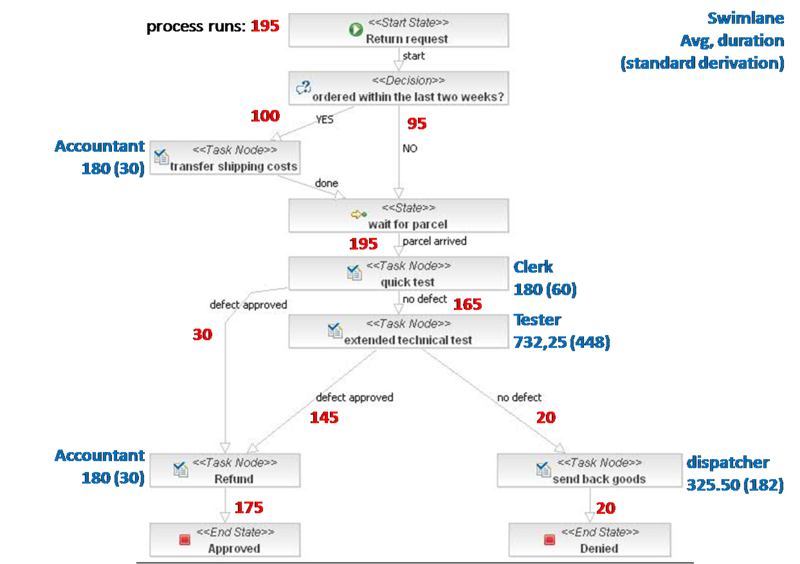 In this tutorial we will look at an easy business process: The handling of returned goods from customers. Think about a webshop for technical stuff, where the customers can send back the goods they ordered within two weeks without any reasons (at least in Germany) or within the warranty, if there is a defect. Typically, the goods are checked from the webshop team, if they are really broken. Let’s assume that our shop makes a quick check after goods arrival, “easy” defects can be approved at this early stage already, but a lot of defects can only be diagnosed with an extended test and additional test equipment. If the defect cannot even be approved with that test, the stuff is send back to the customer, it may not be broken. There is one additional requirement if the customer returns his shopping within two weeks (again: at least in Germany): The shipping costs must be paid for him. So we have to transfer the money to the customer’s bank account in this case. The jPDL sources (the process as XML file) can be downloaded here. A good idea is also to check the sources for the tutorial which are available via CVS in jbpm 3 HEAD, because there will be ongoing development in the area of the simulation. ti1.start("me"); // task "transfer shipping costs"
ti1.end(); // task "transfer shipping costs"
pi.getRootToken().signal(); // state "wait for parcel"
TaskInstance ti2 = (TaskInstance) pi.getTaskMgmtInstance(). ti2.start("me"); // task "quick test"
ti2.end("defect approved"); // task "quick test"
Other process paths can be programmed in such a way too. Again: This is only to “generate” historical data for our tutorial. Normally the historical data is automatically written when people use your application, where the process is deployed into. The whole code is available in the “CreateHistoricalData” class. This data can serve as input for our simulation project, to simulate the status quo. 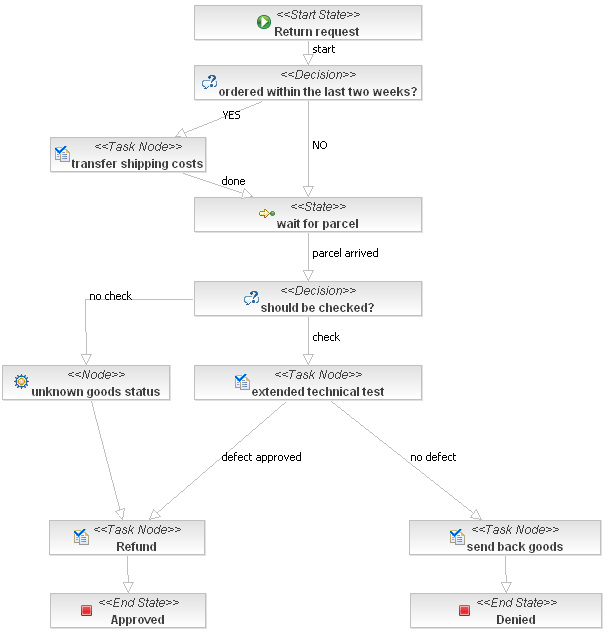 The jBPM simulation tool offers the possibility, to get this data as scenario configuration XML, similar to the XML configuration shown below. This can be directly used (in your Java code) to create an simulation experiment, but also may be printed on screen (or some web page in the console), so you can copy & paste it into your simulation configuration and change it to whatever you want to. The sample data here was only to demonstrate the features to retrieve statistics from jBPM and use it as simulation input. Because of the poor algorithm of generating the data, its value is limited. Transferring costs by the accountant for example, should always take duration close to the average. The big standard deviation is not realistic here, it would only make for tasks, which processing times differs a lot from case to case, a good example can be the extended technical test. Okay, the process runs and does the job well. As the year move closer to Christmas, your manager starts to think about staffing strategies. Your company has a successful year, so the question he asks you is: “How many people do we need after Christmas time? Because of the sales we have we can forecast the number of returns. Please estimate based on these figures how many people we need without messing the processing time”. Seems to be an easy question, or? The last part of the tables gives an idea how many people we need. The more critical my process, the closer I should go with my staffing strategy towards the worst case scenario to add safety. Totally missing at the moment are dynamic phenomena, which may build up some additional delay. To be honest: In this easy example, these phenomena aren’t too big. 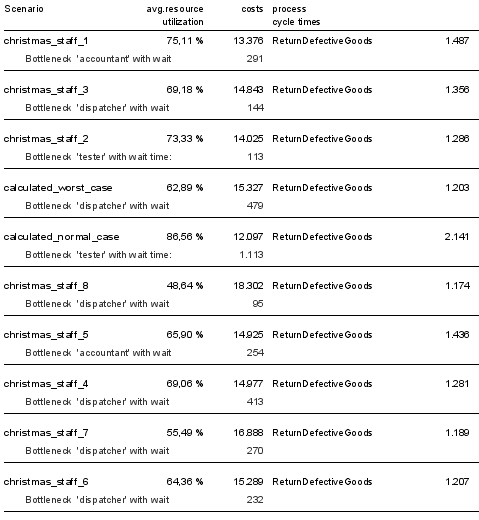 But image more complex scenarios with different processes running in parallel consuming the same resources. There it gets quite hard to calculate it without simulation. And on the other hand: using the simulation tool is not really more complicated than the spreadsheet calculcation. In fact, if it is integrated in your out-of-the-box jBPM environment it gets even easier to use! The results are not so different from our spreadsheet calculation. Again I want to add that this example is not complicated enough to demonstrate the full power of simulation over spreadsheet calculation for this use case. One word to the statistical distributions: I used the Erlang distribution for the time between start events and normal distributions for processing times. I will not got into detail here, but see it as a good default. In your simulation projects you may want to use different distributions, which is not a problem, because the jBPM simulation supports more than these two. You should take into account, that we ignored a warmup period in our experiment, so the system is underutilized at the beginning. The costs for the normal and worst case scenario are not very different, becauseI set the “unutilized-time-cost-factor” to zero, this means, the cost of unused resources is zero * resource-cost. So this is not included in the cost calculation. This can make sense, if the people can do other work in that time, normally the factor should be higher (at least because of set-up times for differnt types of work). Simulation cannot out-of-the-box calculate the right staffing strategy for you, but what it can do is to test your guesses. This means you have two possibilities: First, you can guess how many people you need and simulate with this number. If the resulting cycle times or utilization figures are not satisfying you try slightly different staffing scenarios till you get a result you can show to your boss. The second option is to automatically generate scenarios and chose the best result. This can be done by a brute force approach or some more sophisticated algorithm, genetic ones for instance. The important thing is, that you need to define a goal, which can be checked automatically, for example: “The average process cycle time must be better than 40 minutes, the slowest process must be finished after at least 3 hours”. Let’s look at the first approach, where the simulation is only a tool to support your decision. I defined different staffing strategies as scenarios. You can see it as a guess from me. I don’t want to get into too much detail now. You can explore the results by yourself or play around with different parameters. 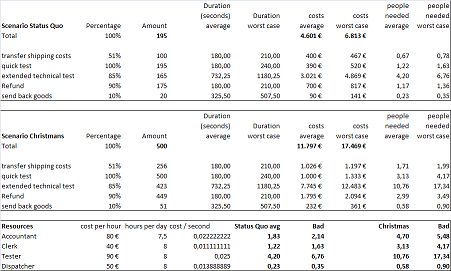 You can easily analyze what influence your staffing strategy has on cycle time for different processes (if you include different processes in the scenarios, all would be listed in the table above), the costs, the average resource utilization and the bottleneck (which means, the resource with the biggest waiting times. However, this is not always a serious bottleneck!). Please note: In this example I have told the tool to include the half of the underutilized time of our stuff as costs. Normally you would now do that simulation game in some iterations, testing different hypotheses and move closer to your goal. By doing that, you gather a better understanding of the dynamics of your system, so you are able to make a well founded decision. In real life you may also want to repeat the simulation runs several times with different seeds (start value for random numbers) to get a better result. The more runs you make, or the longer the single runs are, the better the results. Even if that looks rather simple now, and actually it is for easy cases, you should be a bit aware: Applying simulation for complicated real life situations needs some experience. The second approach would be to automatically find the best solution. 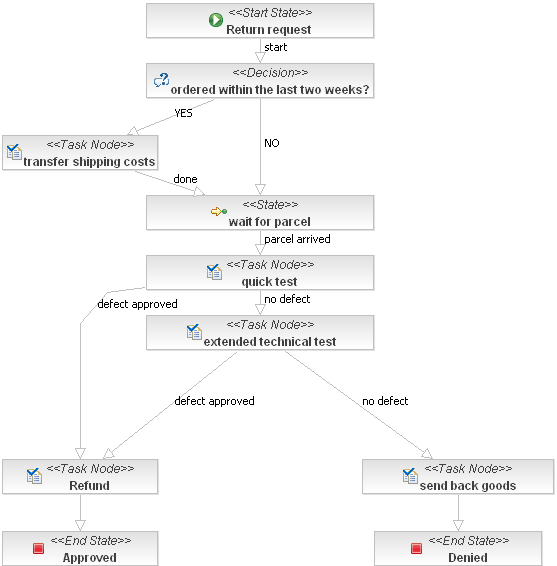 Because generating solution candidates depends on your special application, I couldn’t implement a general solution which ships with the simulation tool of jBPM. For the problem described in this tutorial, the solution could be to overwrite the ExperimentReader, so every time it reads a scenario, it adds multiple scenarios to the experiment by just automatically provide different staffing strategies. To demonstrate the idea, I provide an example in the tutorial source, the StaffingExperimentReader, which uses a very easy algorithm to generate staffing scenarios. In reality you should think about better ways to do that. This results in more scenarios, if you are interessted, here the graphical report from this simulation run. Maybe your company wants to save money, which is indeed hard to image but maybe possible. So your manager has the idea that the technical tests are too expensive. He spoke to a third party company which would buy all returned goods, even untested. This would allow your company to skip these tests. Because you don’t want your customers to know, that they can return even working goods as defect, you make random checks of incoming goods. Based on the figures given above, 15 % of goods are recognized as defect in the quick test, and 88 % of the remaining 85 % are proven as defect in the extended test. Based on these figures, 89,8 % of the returned goods are really defect. To be on the safe side and to pay their own handling, the hird party company charges you 90 % of the estimated resale value of all returned goods. After modeling, you create a new scenario reflecting the changes. This scenario can be compared to the original one (status quo) later to decide which one is cheaper. The scenario is mostly the same, so I will only stress the differences now. Since the “unutilized-time-cost-factor” is set to zero,not utilized resources cause no costs, so I didn’t change the staffing strategy for simplicit, normally you would obviously try to reduce required people too. <business-figure name = "value reduction of returned goods"
<business-figure name = "defect goods"
This means, the new process version would really safe money! Normally you should do multiple simulation runs now to prove these results. Also some changes in staffing scenarios or maybe evaluating a good percentage of checked goods would be a good starting point. Also it may depend very much on the goods you handle, currently all the historical data and the data source is not very realistic. And normally the company gets a refund for defect goods from the manufacturer, if it is broken within the warranty for example. But anyway, isn’t that better than just discuss on a power point level if the outsourcing makes sense? There are still open issues in the area of the jbpm simulation tool. Also I am not sure, if and how some of the features will be used, because the current project where we apply the simulation uses only a subset of the provided features. Same holds true for the graphical reports. I created them to show how you can build reports and to setup a working environment with working examples. Feel free to use Jasper IReport to design your own reports fitting to your special problem.